The Fed continues to be divided over the next steps for its unprecedented monetary expansion program. Varying interpretations and conflicting headlines in the press leave the public bewildered and frustrated. The following two stories for example have appeared right next to one another on Bloomberg today. But now the Fed has a new problem. 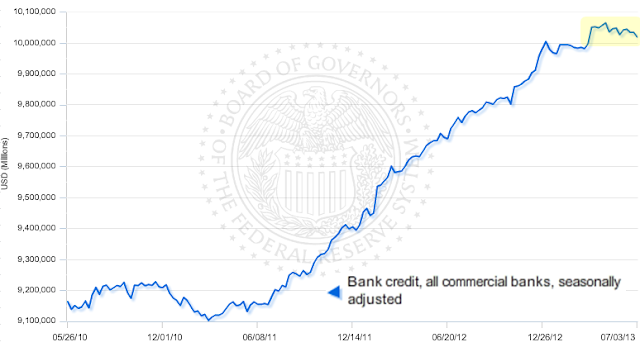 The central bank's securities purchases are financed with bank reserves, which have been rising steadily in 2013 (chart below). And to many on the Fed that was justifiable as long as US commercial banks continued to expand their balance sheets. But recently that expansion has stalled. 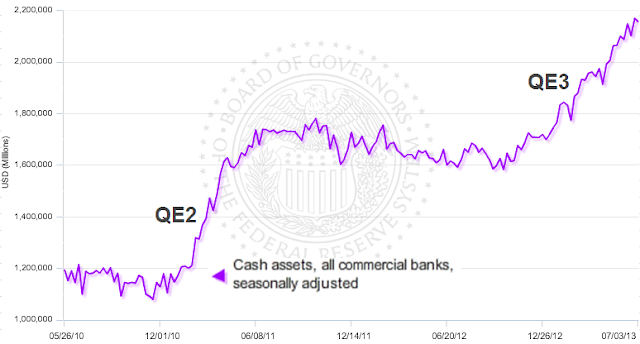 2. continue with the program and risk QE "side effects" without the needed credit expansion (which has stalled). That's why we are likely to see the Fed even more divided going forward, adding to more uncertainty and frustration by investors (including those outside the US) as well as the public.